young leaves are edible raw, though they will sting in the mouth for a short time. young shoots and young plants are edible when steamed/cooked. roots are edible when cooked. grows in moist soil and disturbed areas in plains, foothills, and montane regions. warning: wear gloves when collecting to avoid stings. Stinging nettle is one of my favorite and most routine plants to forage in the Pacific Northwest. On the Gulf Islands of BC, stinging nettle forests often line the backroads and trails in protected areas, so nettle leaves make a daily appearance in my campfire soup. Wearing gloves, I gather large and small leaves, checking the underside of each and discarding any that are damaged or infested. A bag of nettle leaves is required for a meal, since they cook down to a small fraction of their original size when boiled or steamed. I add them to the top of a soup when it's almost done; the steam from the soup is enough to soften the leaves while allowing them to retain texture. 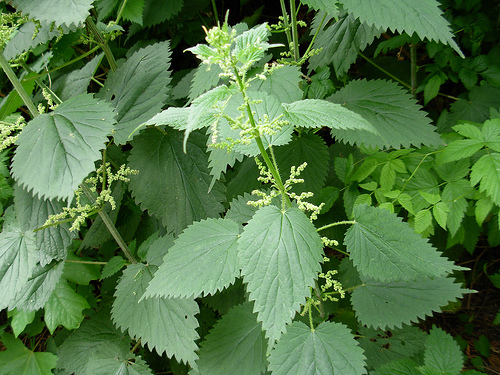 Their taste is excellent and stinging nettles are hailed as a wonder plant for their vitamin content.